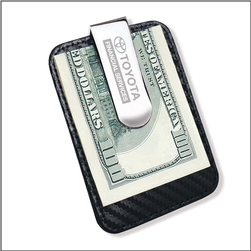 Order Custom Imprinted Money Clips – featuring a leatherette backing for comfort and convenience, and credit card or ID storage. Impress your customers by gifting these laser engraved money clips, makes a great business trade show item. This is a great item for the business world and a popular promotional for real estate, banking, mortgage companies, and more. Order your custom logo money clips today!